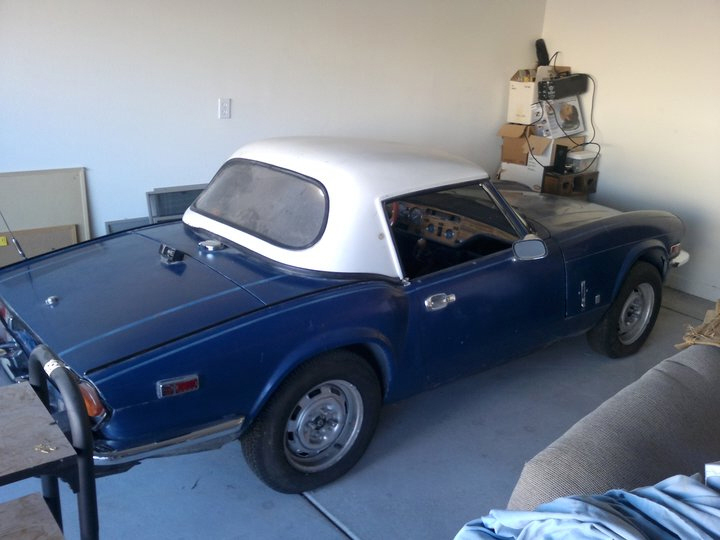 In 1993 I purchased my first classic automobile, a 1976 Triumph Spitfire. After braving the dangerous roads of Las Vegas for 3 years, I mothballed it in favor of a newer and more reliable automobile. Not finding one of those, I bought a Ford. The Spitifire was great fun and I felt it was a reasonably priced British convertible, considering it included a hard top, which seems to be not so easy to find. When it left me stranded on a couple of occasions, it was usually not too difficult to find ways to get it home or back on the road. A few years ago, I ripped out some of the interior with the intention of making some quick cosmetic fixes, but thought better of it before I went too far. Honestly, it would be much better to get it running and on the road again first. July 2, 2011: Success is based on one's perspective. While the Triumph didn't exactly roar to life on first attempt, it did have a sputter or two. And while my optimistic nature had me roll it out of the garage down a steep driveway, leaving me stranded in the cul-de-sac temporarily, at least my two boys were able to assist in returning the vehicle to its safe haven. It is clear that the next step will involve ridding my classic of its putrid petrol and cleaning out the fuel system. Here is some video documentation of our escapades.